Easy I-95 access: VA #89. Huge, FHU 50-amp level pull-thru sites. Propane. Updated bathhouses & fitness center. Free WiFi & Cable, free waffle breakfast. New rally room, kitchen and coffee bar. Hospitality Galore! Tried this place out as a shakedown run for our new 30 foot TT. Great accommodations easy in easy out. Nice staff everything amazingly clean. Brewery across the street is really good and had food truck. Not exactly where you want to go to enjoy great outdoors but kids liked the play area and nice basketball court. Will come again. Traveling full-time in a 38-foot coach we stayed 3-nights in a site for big rigs (site # F29). Pd $68 night. This is a nice park with level gravel sites, but we're giving it a poor rating (1-Star) because they ignored our complaints about the wifi. We had planned to stay longer, but after three days of complaining to the office about having no wifi, we're leaving. We really would have appreciated a follow-up call, but we never heard anything. Every day we'd call about the wifi and the office personnel would tell us a different story. When we complained on the third day, we were told the Owner had attempted to fix the wifi the day before, but it was still down. Unfortunately, we require wifi wherever we stay, which is why we make it a point to always verify if the park sites have a wifi signal before making reservations and this park had assured us there was a good wifi signal at each site. We could not get on the WIFI to check the weather or even our email. For some users such as ourselves, wifi is an important feature and was one of the reasons we decided to stay here. Needless to say, we're disappointed. We stayed at this facility from 9/14-9/18 due to evacuation from Hurricane Florence. 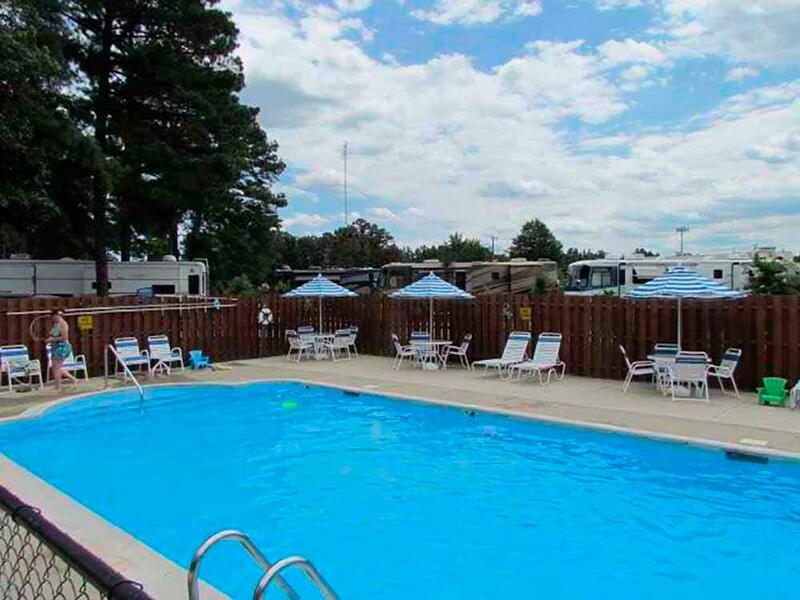 The campground is kept beautifully and cant say enough good things about the staff very accommodating and friendly. Would highly recommend this campground sites were clean and easy access . The “ waffle breakfasts were great” !!!! Easy check in. Friendly staff. Gravel/asphalt roads. Gravel site w/picnic table and fire ring. Mature tress for shade. Varied sites from narrow to wide. We had a pull through that was very accommodating. Good camp store. New and clean pool. Close to I-95 for easy on/off. Very good exercise room. Clean bathrooms and good laundry if needed. Fair amount of seasonas, but also a good amount of overnighters. Very quiet campground. No rowdiness. 30 minutes to downtown Richmond if interested in historical sites. We stayed at this place for one night on the way to florida and one night on the way back from florida. The staff and the facility are awesome. Great Good Sam Park. Their new pool opened while we were there and it was a lot of fun with the jets and lights - plus the tables and chairs around it were a great place to sit and relax. The store and the staff are top notch - all delightful. The laundry was very nice as well. Everything was clean and well maintained. We would definitely stay here again. I have stayed at this campground several times and sometimes my work causes be to adjust my schedule and their staff has always been accommodating. I actually had to stay in the hospital for a couple of days and needed to extend my stay to recuperate and the staff was great. Love the concrete padded sites but have stayed in different sites and they were great also. Waffle breakfast is great and plenty of room to walk the dog and they have just built a new dog park and have a new basketball court. Would recommend this place to anyone. It ranks in the top two places we like to stay with a close second behind the KOA in Rushmore, SD and that is only because of the view. Love this place ! Close to interstate for overnight. The pull thru was convenient, and they had a free waffle breakfast. They had a store in the check in area, which we did not need, but it would keep you from having to unhook for overnight stay. We did not use their restroom facilities. Campground was a perfect spot for an overnight stop. Facility was attractive and very well maintained. Access to and from the campground and site was easy and convenient. Staff was friendly. Pull-through site was clean and level. I would definitely stay here again. Very nice campground. Well kept and clean. Mature trees at each space to provide shade. One of the nicer grounds I have stayed at. I would stay here again. We stayed overnight. It was perfect because it is close to the highway the drawback is the noise it generates. Well maintained. The breakfast was perfect before hitting the road. Staff very courteous. This was an overnight stay and we arrived after hours. It was a little difficult to figure out sites markers. Next morning check-in, the receptionist was not very friendly. The site had full hookups but we only used electric. It looked like quite a few full-timers. Nice shaded lots. Good for overnight. 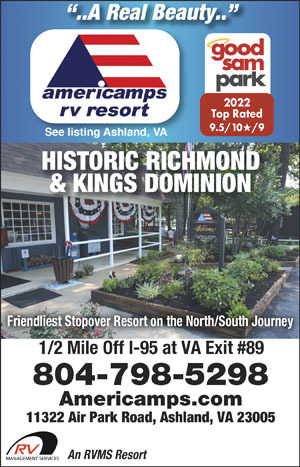 Loved this campground, stayed here a week while we toured Richmond. It is clean with large sites that have easy in and out. Ours was a drive through.. Staff was great, very friendly. Plus a great camp store with everything you might need.Was a bit pricey at $ 50.00 a night . They serve a waffle breakfast every morning with juice, coffee etc.. Easy access to the highway to get into Richmond or Monticello, and to head back home after a great trip. We during Memorial day weekend. The weather was terrible as it was raining due to a tropical depression. 1st I was able to make reservations for 1 night. 2nd we were escorted to the sight that was large enough for our big rig. They had lots of activities going on that we didn't get to participate in but we're available. It was REALLY nice they serve waffles, juice, fruit cups and coffee every morning at no additional charge. We would like to stay again for a longer period of time to participate in the activities. Since we are self contained we didn't use the bathhouse. The grounds and camp sites are maintained and the staff was very friendly. This is a clean resort with friendly people. I enjoyed this campground so much that we will stay here again in the future. This campground is in my backyard. I've ridden by it for years, but never camped there because it was so close to home. Well, I bought a new camper and needed somewhere close to try it out because of local obligations. I called and one of the owners squeezed me in at the last moment and we had a great time. The facility is great, other campers that we met were great and really had great things to say about the facility. Some were snow birds that stopped there each year in their travels up and down I95. I met the owners during my stay and you won't find nicer, more accommodating people. I will definitely recommend this to the campers that I know.